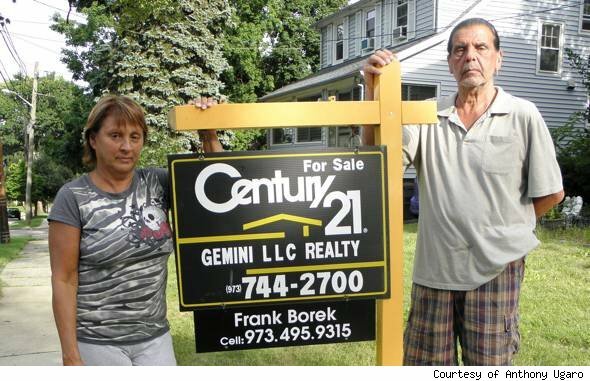 Has HAMP Gotten Any Better at Helping Distressed Homeowners? Before the housing bubble burst, Anthony Ugaro lived across from a country club in Bloomfield, N.J. “I was playing golf every day. I thought I was a duke,” he said. But the good life began to unravel for Ugaro, 65, when the military veteran lost his job at an electronics company in 2009. Soon after, he was diagnosed with heart disease, which hampered his ability to work and to keep up with mortgage payments. Suddenly facing foreclosure, Ugaro twice ignored his doctor’s advice and took on part-time jobs to make ends meet. His wife, Judy, currently works three jobs, he said, and they have exhausted $55,000 in savings, all to stay afloat. The Ugaros (pictured above) are the kind of homeowners that the government was trying to help with its flagship housing aid program. But three years later, after repeated efforts to work with their lender through the Home Affordable Modification Program, they’ve joined millions of others who’ve had their HAMP applications denied, for reasons many of them find hard to understand. And the Ugaros have just about given up hope. Ugaro said he first applied for a mortgage modification under HAMP about a year ago. Wells Fargo told him that his household did not earn enough monthly income to qualify, he said, so Ugaro, who has six stents in his heart, got a part-time job as a crosswalk guard that he said paid $324 a month. “I could see why Jesse James robbed banks,” said Ugaro, who finally stopped paying his mortgage two months ago and is now trying to sell his home in a short sale. He is one of an estimated 2.8 million distressed borrowers who have been denied a permanent modification under HAMP, according to the Government Accountability Office. By many accounts, HAMP has not been adequately implemented by mortgage servicers. The Ugaros’ story is a reflection of the still-marred HAMP application process more than three years after the program’s inception — both in the the way it’s so far failed to help many homeowners like them and the way it’s showing some improvement. Overseen by the Treasury Department and funded by the Troubled Asset Relief Fund, HAMP was launched in 2009 to provide relief to a wide swath of homeowners facing foreclosure in the wake of the housing bust. The program is designed to lower monthly mortgage payments for distressed borrowers by either reducing interest rates, delaying payments, slashing loan balances or using some combination of the three. The results of a ProPublica questionnaire in the summer of 2010 suggested that many distressed borrowers have had experiences similar to the Ugaros’ in attempting to qualify for HAMP. Two-thirds of respondents to the questionnaire who indicated that they were denied HAMP modifications said that they were given “different or conflicting reasons” for why they didn’t qualify. Alys Cohen, a staff attorney at the National Consumer Law Center, said widespread mishandling of applications has plagued HAMP since it’s launch in spring 2009. While many HAMP denials are merited, many others are a result of mortgage servicers’ mistakes, and those servicers aren’t subject to fines for flouting HAMP guidelines, Cohen said. “Until people can protect themselves directly in real time, servicers are not going to follow the rules,” and relief to homeowners will not flow as it should, she said. Since the Obama administration introduced HAMP — which had reduced monthly mortgage payments by a median amount of $534.98 as of April 2012 — only about 1 in 4 applicants have received a permanent modification. According to the Government Accountability Office, 2.8 million have had their applications denied or their trial modification canceled. To date, a little more than 1 million have received a permanent modification — but the program was aiming to have helped 3 to 4 times that. Despite a record of bungling HAMP applications, servicers still appear to have made strides in implementing the program over the last two years. Ironically, the Ugaros’ experience points to some of them. Anthony Ugaro, who worked at an Army hospital during the Vietnam War, said that he only had to wait eight weeks for written denials to his applications from Wells Fargo. That’s a big improvement from ProPublica’s finding that homeowners waited an average of 14 months to learn if they’d qualified for HAMP. (Two-thirds of those ultimately rejected said that they never received written denials, according to the ProPublica survey.) A servicer is required to send a rejected borrower a written denial under HAMP program guidelines. The Treasury Department’s most recent Making Home Affordable Program Performance report, released monthly, showed that servicers have, indeed, made progress in using HAMP, particularly in the area of income calculation. For example, the Treasury found that more than 1 in 4 calculations of a borrower’s income performed by Wells Fargo when evaluating HAMP applications was at least 5 percent off the mark in the first quarter of 2011. Now, just 1 in 50 are off by that much. Could the Ugaros have been mistakenly denied a HAMP modification? That’s unclear. But the couple does appear to meet all the main eligibility requirements of HAMP. Their home is their primary residence, their mortgage was originated before 2009 and they owe less than $729,750 on their mortgage. (They owe about $230,000.) Anthony’s layoff and heart disease diagnosis also qualifies as a hardship. They seem to qualify for a HAMP modification financially, too. The Treasury’s latest performance report said that the average household’s median mortgage payment before receiving a permanent modification equaled 45.4 percent of the household’s monthly income. When they applied, the Ugaros’ $2,400 monthly mortgage payment was between 50 and 60 percent of their $4,300 monthly household income. If anything, the Ugaros would appear to have not been making enough money to qualify, but they were told the opposite for their second denial — that they made too much. That makes Wells Fargo’s decision on their applications difficult to digest for the couple. A Wells Fargo representative told AOL Real Estate that the Ugaros’ income was, in fact, not a factor in denying them a modification, but didn’t offer further explanation. “We are attempting to reach the Ugaros to discuss their current situation and will try to work with them on potential options for assistance,” said Vickee J. Adams, vice president of external communications at Wells Fargo. If the test determines that a modification will save an investor money, then it must perform the modification. Otherwise, a servicer may choose not to. A failure by lenders to either correctly enter or calculate the test numbers has resulted in a substantial number of improper HAMP denials, according to the Office of the Special Inspector General for the Troubled Asset Relief Program and the Government Accountability Office. People denied HAMP modifications can call 1-888-996-HOPE and ask to speak to “MHA Help,” and “depending on the circumstances,” this may require a servicer “to re-solicit or re-evaluate impacted borrowers,” the Treasury Department told AOL Real Estate. But Cohen said that only a small minority of aggrieved HAMP applicants know about the option and pursue it. She also said that even if the Treasury Department determines that a borrower was wrongly denied a modification, it has trouble holding a servicer’s feet to the fire. It cannot impose fines on lenders for breaching HAMP guidelines. What the Treasury can do is nudge lenders in the right direction by withholding or reducing financial incentives. It withheld nearly $200 million from Bank of America and JPMorgan Chase, before releasing those funds as part of the “robo-signing” settlement. But that approach hasn’t cut it, Cohen said. “To date, enforcement by the Treasury of HAMP guidelines has been abysmal,” she said. The Consumer Finance Protection Bureau could potentially create rules and penalties that would impose more discipline on servicers, she said. In fact, the agency, which was created in 2011 as part of the Dodd-Frank Act, is in the process of crafting such rules right now. But Cohen wonders if such a rule will offer enough protection. Principal Reduction: Is Debt Forgiveness Fair?